Do you have memories of being a kid and spending hours on the playground equipment and using the swing set at the elementary school or local park? If so, you probably wished that the playground was in your back yard so that you had almost nonstop access to the fun the playground equipment provided. While this wish may have remained only a dream while you were growing up, you can now make this wish come true for your children. 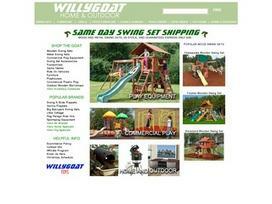 WillyGoat offers many types of play equipment that will bring your children enjoyment for not only hours but years. You have numerous options at WillyGoat's website. You can choose from metal swing sets and wooden swing sets, swing set accessories for added fun, trampolines, game tables, and playhouses. WillyGoat also sells commercial play equipment, attesting to the durability and safety of all the equipment the company sells. The company also sells a great range of ride-on vehicles, including ATVs and motorcycles, as well as scooters, wagons, and rocking horses. You can also choose from tricycles, unicycles, and push cars. As you can see, whatever you want, WillyGoat has it! You may wonder whether outdoor play equipment is within your budget. But by visiting the WillyGoat website, you may be surprised to find that though the products are built to last, they aren't sold at unreasonable prices. You can even shop by price range. You will find a variety of toys and other children's items for under thirty dollars. The company also regularly offers specials on products (sometimes for only one day!) so visit the site often to see what deals are available. So go ahead and find the outdoor play equipment that will delight your children. It's only fair to provide a warning, however. Your backyard might become the popular hangout of all the neighborhood kids! WillyGoat definitely wants to make your children happy, but the company also wants you to enjoy being outdoors as well. To do that, the company sells stylish and comfortable patio furniture, grills, heaters, water floats, and camping and picnic items. You will also find bigger items, such as gazebos and spa enclosures, garden sheds, and greenhouses. If you are looking for a raised garden bed, planters, or rain barrels, WillyGoat has those as well! The company doesn't stop there, though. You will also find indoor furniture, home decor, clocks, fitness equipment, fireplaces, and kitchen items. Share what you think about WillyGoat, and your favorite ways to save there! Excellent deals and lots of choices for swing sets! Impressive selection of trampolines and swing sets for kids. My kids love the swing set we got from Willy Goat, and it looks great in our backyard.